ACCESS TO ENERGY is an important determinant of the quality of life. 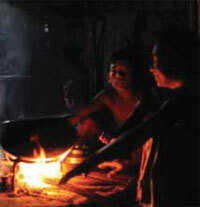 Inequality of access to energy for cooking, lighting and livelihood purposes has engaged the attention of researchers, policy planners and activists in recent years. In 2005, India launched the ambitious Rajiv Gandhi Grameen Vidyutikaran Yojana that aimed at universal electricity access by 2009. Similarly, efforts towards universal access to modern cooking energy were initiated by creating an LPG distribution network and deploying renewable energy-based cooking energy solutions. Internationally too, in April 2011, the UN General Assembly declared 2012 as the International Year of Sustainable Energy for All. Increased realisation of the futility of business-as-usual approach—expanding conventional energy infrastructure, particularly power—has led to a serious search for alternatives. Renewable energy solutions provide one such promising alternative. Micro, using the Census data at the district and the sub-district levels and, if possible, at the village level. The macro picture indicates the gravity of the problem. To begin with, we will concentrate on this picture. 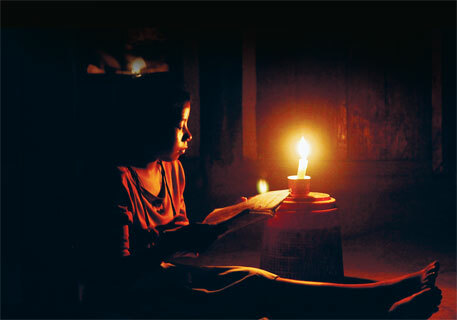 According to Census 2001, as many as 84.7 million households did not have access to electricity. In Census 2011, the figure has come down marginally to 80.7 million households. A break-up of the country’s population into rural and urban segments indicates that about 75 million rural households (44.7 per cent of rural population) lack access to electricity, while only 5.8 million urban households (7.3 per cent of urban population) lack such access. This makes the extent of rural urban inequality obvious. The fraction of non-commercial energy in the energy consumption basket is another macro-indicator. Energy forms that are not sold in the regulated markets and are usually produced and consumed by an individual household are referred to as non-commercial energy. Use of non-commercial energy has increased in absolute terms from 74 MTOE (million tonnes of oil equivalent) in 1961 to 174 MTOE in 2011. But it has come down in per capita terms from 169 KGOE (kilograms of oil equivalent) in 1961 to about 144 KGOE in 2011-not a significant decrease (see ‘Skewed energy equations’). Here it would be pertinent to point out that the latest McKinsey report (January 2014) puts the current consumption of non-commercial energy at 160 MTOE. The report also reckons that consumption will stay at 160 MTOE till 2030 in a business-as-usual scenario. Even in an optimistic scenario aiming at energy independence, consumption of non-commercial energy is projected to come down only to 147 MTOE. 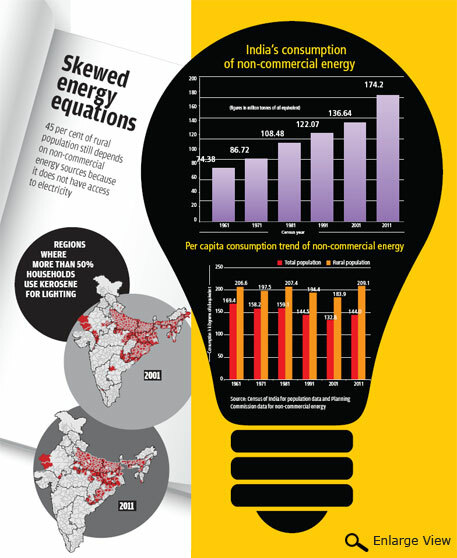 It is apparent that the segment using non-commercial energy is no one’s concern. This can be further elaborated when we look at the meso picture. 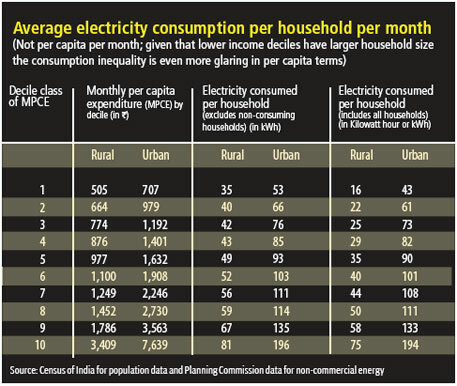 The economic deciles-wise energy consumption among rural and urban households not just reveals the rural versus urban consumption inequality, but also shows the intra-rural and the intra-urban consumption inequality (see ‘Average electricity consumption per household per month’). The data makes it clear that there is considerable inequality in energy consumption per household per annum in the rural area. What is more dramatic is the data related to the regional inequality in the access to electricity for lighting purposes in rural households based on the Census 2011 data. A compact cluster of districts in the eastern and northern regions still has nearly half the households using kerosene for lighting in 2011 because they lack access (see 2011 map). This data reinforces the urgency of eradicating basic energy poverty, especially since deprivation in this cluster is a strongly enduring one: even in 2001, it was nearly the same cluster where more than 50 per cent households were using kerosene as source of lighting. More on this in the next piece where we will discuss the different sources of fuel and lighting. S B Agnihotri is Secretary Coordination, Cabinet Secretariat, New Delhi. It is now clear about the way forward - Setting up of solar panel manufacturing units across India, with Technology and additional financial requirement inputs to be met through Govt sponsored agencies. Setting up of Solar Generating Units in every village in the country from Kashmir to Kanyakumari after formulating a master plan and pushing this initiative forward giving it higher priority than infrastructure growth. Growth will automatically follow, employment can zoom forward and sustainability can be achieved.